« Stonehenge Spring Equinox 2010? From the grassy deserted plains of southern England rises a circle of standing stones, some of them up to 24 feet tall. For centuries they have towered over visitors, offering tantalizing hints about their prehistoric past. For centuries, everyone who has stood before them has wondered the same thing: Who built this mysterious rock monument? And why? “Since Stonehenge was built and rebuilt over a period of centuries, no one group has sole credit for its construction, but the main building seems to have been done by a people known as the ‘Beaker Folk,’” says Benjamin Hudson, professor of History and Medieval Studies at Penn State. The Beaker Folk (who earned their name from the distinctive inverted bell-shaped pottery drinking vessels they made) scattered throughout prehistoric western Europe. 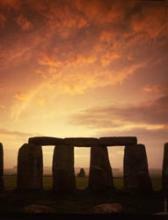 The earliest construction at Stonehenge began about 3000 B.C., says Hudson, with a stone circle inside a ditch and bank. Within that circle lay a timber building; researchers have excavated from the site about 56 pits containing the remains of human cremations. The means of moving those enormous standing stones has provoked centuries of speculation, with theories ranging from demonic powers to Merlin’s magic to alien technology. The reality is much more ordinary, says Hudson. “Much of the construction was little more than putting enough men under a stone to move it into place,” he notes, “although some basic engineering was required for the larger stones and the lintels.” One theory holds that the builders used simple inclines and levers to move the stones into place. Like the Egyptian pyramid-builders, the Stonehenge constructors relied more on brute labor than sophisticated technology. Though one of the most complete and monumental examples of Neolithic and Bronze Age construction, Stonehenge was not alone in its time. Hudson notes one estimate that places it among 300 surviving stone monuments throughout the British Isles—including the famous stone circle in Avebury. The connections between and among these sites often remain murky, and undoubtedly many creations of the Beaker Folk have returned to nature, leaving few traces of their existence. “Stonehenge forces us to reconsider the period of history that is not accompanied by written records,” Hudson says. Since the builders left no explanation, the precise purpose of their work remains obscure. 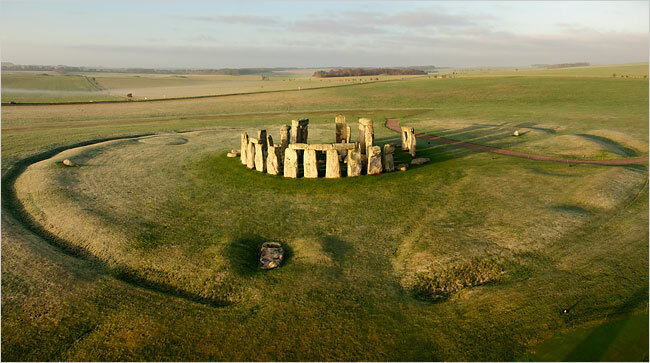 One theory sees Stonehenge as a temple, pointing to the elaborate landscaping surrounding the site. More recently, historians and archaeologists have suggested it provided an observatory for either moon or sun cults. The Beaker Folk are believed to have been sun worshipers who aligned Stonehenge with certain important sun events, such as mid summer and winter solstices. Perhaps it is that elusive meaning that has, for centuries, drawn people to Stonehenge, to sit and wonder among the silent stones.